Crews working to resurface Fairground Road. The Scioto County Engineer, Craig J. Opperman, P.E., P.S., announced the continuation of the multi-year extensive roadway resurfacing program. This program includes the placement of hot mixed asphalt pavement, cold mixed asphalt, and chip seal pavement resurfacing on the county road system. The hot mix asphalt paving program administered by the Scioto County Engineer Craig Opperman was awarded to the low bidder, The Shelly Company, at a cost of $1,559,500. The program will provide over 25 miles of paving. Much of the project is paid for through a grant, worth $704,303, obtained by the Scioto County Engineer through an Ohio Public Works Issue 1 program. The remainder of the funding for the project was provided by local investments paid from the County Engineer’s share of the Motor Vehicle and Gasoline Tax and participating Township Trustees. The hot mix paving program began on Friday, July 29, 2016 on Fairground Road, and is scheduled to be completed by the end of September (weather permitting). 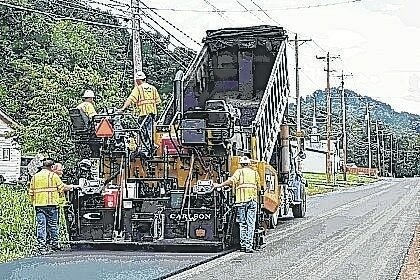 Some Township Roads may have to be closed to traffic while full-width paving is performed on narrow sections of roadway. All other roadways will have traffic maintained by one lane flagging operations and minor delays should be expected. This year, the cold mix paving program has concluded, with Dewey Extension West and Big Run Road having been completed on June 7th and June 14th, respectively. This program paved 2.90 miles at a cost of $73,339.87. The cold mix paving process permits the development of pavement strength and repair of the road surface in a financially efficient manner. This process includes material production and placement performed entirely by Scioto County Engineer employees, thereby maximizing tax dollars while fortifying and preserving our lower-volume county roads. The chip and seal program is an operation involving an application of a liquid asphalt emulsion and cover aggregate, performed entirely by County Engineer Craig Opperman’s employees. The program, scheduled to begin on Monday, August 22nd, will result in the resurfacing of 55.39 miles of roadway and will come at an estimated expenditure of $399,637.22, provided entirely by the County Engineer’s share of Motor Vehicle and Gasoline Tax revenues.